It's finally here! In today's video, you get a first look at the new, fully visual theme builder we've been feverishly working on. And there's more information about how you can be among the first to get your hands on it. The builder looks similar simply because we don't want you to have to learn two different user interfaces to edit your theme and your pages. There are several reasons why we're building this as a theme. The primary one is that WordPress is built to operate with a theme as the basis and in fact, it can't run without one. Loading a theme only to override most or all of that theme with a Thrive Architect components wouldn't be ideal. The end goal in what we're building is to bring instant, truly visual front end editing to your whole website. To start, you'll be able to customize your page templates and dynamic content. We will then add custom post types and support for popular plugins like WooCommerce. Eventually, the new theme builder + Thrive Architect will provide you with everything you need to build and edit every aspect of your website. If both of these tools offer front end, visual, instant editing, what exactly is the difference? In other words, what's the difference between a content editor (Thrive Architect) and a visual theme builder? The main difference is the level at which you build stuff. With Thrive Architect, you're building at the immediate, individual page level. Changes you make affect the page you're looking at and there are generally no surprises. How Much Do You Have to Worry About Technical Details? If the above sounds a bit confusing to you, don't worry: most users don't have to be concerned with the technical details. As always in our products, we will make pre-designed, ready-to-use templates available for you. You'll be able to pick a template that matches your needs, install it on the theme builder and make it perfect for you with a few simple tweaks and edits. For advanced users, it means you can be fully creative and build anything you want. For beginner users, it's very simple. You don't have to dig through menus. If you want to change what something looks like, you just open the editor, click on the thing you want to change and make some edits. That's the beauty of true front end editing. We now have enough of this product built and a clear enough plan to announce a release date for the beta version: July 25. This will be a first usable version of the new theme builder. It will have all of the basic features needed for a theme and the dynamic content and page template editing, as shown in the video. What it won't have is all the integrations, bells and whistles and refinement for a full, live website. This will be a version that's not suited for deployment on live sites yet. The goal of the beta testing is to get enough feedback to make the theme builder solid and stable as quickly as possible. We also plan to add some more features and functionality before a public release. At this point, we don't have a date for stable beta or a public release yet, but we'll keep you updated as we continue development. How Can You Get the Beta Version? Apply to become a beta tester. If you qualify, you'll be approved and invited to join our beta testing group in a couple of days. You'll get an email notification on July 25, when the beta version of the theme builder is available. Whether you help us with the beta testing or not, I'd love to hear your feedback! What are your thoughts on the preview you saw in this video? What do you think of the concept and the plans we have for the theme builder? Shane it’s awesome to see that there’s a release date for the beta, and even more awesome that i’ll finally be able to make my theme look the way I want, without having to use a Non-Thrive product. Question, will Custom Fonts be coming with this theme builder? It was taken out of Thrive Architect (not sure why), and I have some premium fonts that I purchased that I would like to use with Thrive. Hoping you’ll say we’ll get that feature in the Thrive Theme Builder! We are working on a solution for custom fonts which will be released as a core part of our products. So it will be part of the theme builder as well as Thrive Architect. Please do. This has been a major flaw for TT as custom fonts are part of branding. I am using other builders/themessince the launch of TA specifically due to this problem and it’s a shame as I continue to pay for TA just waiting for this feature. Yes, it’s a pain I know. I’m sorry it has taken us so long to amend this issue. I myself am a bit of a font nerd and so are the people on our design team, so we have many internal advocates for fixing this issue. This looks like a game changer. Something we have needed for a long time. I would like to know how much life is left to the 10 current themes after launching the new version. We are not selling the themes anymore. We will still support them to keep them compatible with new WordPress versions and such, until at least the end of 2018. Will the themes be available within the builder as starting templates we can work from? The builder will come with various templates you can download and apply. IS there a projected timeline for release? I do hope the existing themes will be supported beyond the end of 2018. If the BETA version of this is due out at the end of July, by the time the stable release comes out, there won’t be a whole lot of 2018 left. I have used the existing themes on a number of sites and been quite happy with them (though I’m very excited for this new Theme Builder for sure!). I would hate for sites with the existing themes to have issues and not be supported if WP makes some kind of change. If this is true why can we not get license keys for the old themes? What am I to use in the meantime? Shane, Thanks for the walkthrough. If you are not selling the themes anymore and one would assume phasing out the updates to the existing themes… Will you provide a process for us to crossgrade from one of the themes into the Thrive Theme Builder and retain the existing stock elements/layouts of your previous stand-alone themes? For example, we built our business on the Storied theme (Child theme) with WooCommerce driving our sales. The concern we have is having to “redesign” the site in the new TTB method and the seamless integration of WooCommerce. Could you comment on the upgrade/crossgrade process you are building into the future Thrive Theme Builder theme? Thanks for your comment, Richard. We’ll try to make the transition as easy as possible. It definitely won’t be a simple, one-click affair, but I want to make sure that you can upgrade to the new theme without having to worry about the state of your website. Will you have a starter template for each of your themese for those of us who have purchased them? It’d make our transition easier. Hi Richard. We have been thinking about creating modernized skins based on the previous themes, yes. I’m not 100% sure about this yet, so no promises. But we’ll definitely try to make the transition as easy as possible. It would be nice to get a discount towards th he cost of the new theme builder if we were a theme customer since they will no longer supported in the future. So, this means that in order to keep our sites up to date past 2018, if we are currently using any of the 10 Thrive Themes, we would basically need to change to the new super theme or any other theme from a different vendor, correct? At some point, yes. We have barely updated the themes since we’ve been working on the new one, but they still work fine. So you can expect them to keep working for quite a while, even after we stop updating them. All Thrive plugins will still work with any other themes, right? That begs the question as to what happens to sites that are already built with a current thrive theme once you end support and upgrades. Is there a conversion process and how will that work? In general, you can always switch from one theme to another in WordPress, without compromising your content. It’s usually not a completely seamless process (you probably have to check your site, make some edits, maybe redo a few pages to get everything to look just right), but in principle, that’s something themes are built to handle. It looks great. Looking forward to it. But, I’ve been waiting for the new theme builder for a while, but if you’re not going to be supporting the old themes and I don’t want to risk bleeding edge blow ups, even though I’ve already paying you now for all the themes & plugins, I’m not sure what to do. Is it better for me to move my large html website to some minimal theme like astra and then move my site over once your new theme is out and has been tested by public and relatively debugged for a few months? Vs me investing time trying to learn the focus theme and thrive architect which will soon be useless and not supported and a waste of my time and life energy? We’ll still be supporting the old themes the same way we have for the past year, for a while to come. B: To build it mainly in thrive architect inside of the focus theme? I love this idea , I was looking for something like this for a long time ago. Some tool to personalize the way you show the information to the visitor in the whole site without using any code and complicating solutions. For example the way to personalize the blog post. And i also expect with this new theme builder you can personalize the way you show the header with the principal menu like many times Shane Melaugh do with landing page from scracth but in this case with a complete site . I expect can test this beta version theme in 25th of July. Greetings from spain and congratulations Shane and all your team for creating innovations and solutions for customers. Yes, editing your headers, footers and menus is part of this. indeed I have a lot of high expectations. We’re looking forward to releasing this as soon as it’s ready. This is so awesome, and incredible powerful. I have been waiting for new themes from thrive for some time, now I’m sure it has been worth the wait. So many times have I wanted to change text size or margins in the sidebar or similar with css, only to find that it make the same change another place or it breaks something. With this new theme builder these kind of problems will be gone. I was just whining about this in the forums yesterday so I’m really excited to hear about this! Great work team. So, this will work with any theme that uses Thrive Architect? Also, we will be able to edit the header, footer and make them sticky? This is like a theme framework/builder so you will have to use this theme/framework in order to customize all that you see in the video (header/footer/archives pages/etc..). You won’t be able to do so with other themes. All your other themes will function just like they do now with Thrive Architect. This will be a separate theme, not a plugin that you add on top of a different theme. So… what would be the correct workflow if I want to switch from FocusBlog (for example) to the new theme builder? Should I create a child theme, build my ideal site in “theme builder”, then switch it *on* in the WP dashboard? I’ve been waiting for a reply to your question…It’s a good one, especially for someone like me who is ‘on the fence’ about purchasing. The last thing I would want to do is work with a legacy theme only to then have to re-create in the new framework. Can the Admin please provide a suggested workplan for various cases…ex..those with existing legacy themes and those who are considering purchasing? I don’t believe there has been a definitive posting about this. Same here – I’d like to know the answer to this as well. Same question here – Should I progress building my site with the Focusblog theme or should I wait? Or… will we be provided with a ready to download preset-file for this new upcoming theme that will mimic Focusblog and the other legacy themes? Will there be integration with e-commerce platforms as well say for example Woocommerce? Absolutely looking for this feature. Not being able to change the current woo comm product page layout is infuriating. It says that right above. Yes, WooCommerce integration is high on our list of priorities. We won’t have this in the initial release version yet, but it will be in an early update. It should indeed be #1.5 on the list, considering the ecommerce explosion. Is there a kind of timetable for the releases? So we are able to decide to wait or move forward? The only reason I am working with other solutions/pagebuilders is till now only very poor support of WooCommerce within your products. I feel quite pitty about this, since I like your plugins the best. I wish so much you would not omit ecommerce/woocommerce integration anymore… thank you for otherwise excellent work and educational material. Thank you for your feedback! We are making WooCommerce support a priority for the theme builder. My hope is that this will work with products like LearnDash LMS as well. Will that be possible at some point? I don’t know if we’ll integrate with LearnDash specifically. Depends on demand. Shane – LearnDash PLEASE…over the last year my LearnDash enquires have spiralled – one every day or two. Their page design is something that lets them down but is a hugely growing platform. Another vote for Learndash. I guess the key for integration will be the ability for the builder to set the format/template for custom post types as well as pages/posts. That way we’ll be able to style the look and feel of learndash courses, lessons etc which are all custom post types. Another vote for Learndash indeed! Another vote for Learndash. I use it a lot. Nice… Looks Great – Looking forward to trying it out! Glad you like what you’ve seen so far! Just so my understanding is correct. So, this isn’t a new theme that you are building. It’s a theme builder that works with any themes. so you take a simple standard theme and transform it to the design that you wish. Is this correct? Or is it a New Thrive Theme? No, this is a theme. It’s a theme that has all these design capabilities built into it. Theoretically, it’s possible to make a builder that can be used with other themes, but the end result isn’t the kind of thing we want. Because you end up with kind of a “fight” in the code, where the theme tries to load styles a certain way and the editor/customizer overrides those styles with new ones. It’s not an efficient way to do things. Think of it like this: if you want a white wall, you can paint the wall black first and then cover it with many layers of white. But it’s better to just paint it white to begin with. So, the theme builder is a theme of its own and all the customization you make is the original layer of paint, not layers of paint on top of something else. This will be so awesome for my new projects coming ahead. This will change how I structure everything for the better. Your team definitely doesn’t rest on their laurels! Way to keep innovating. Thanks for the heads up. I have many website projects I’ve been delaying waiting for this release! This will now make it much easier to create the site envisioned – thanks! This is fantastic!!! Will we be able to update the menu? For example, I’ve made poor CSS attempts to get my “Schedule an Appointment” menu item to stand out by making it a bright color while the rest of the menu options are the same color. I would love for this to be easier! The new theme builder looks just amazing!!! Exactly what I would expect from the great folks at Thrive Themes. One question, will there be a contact form built in with the theme builder? Thanks for your great work. A contact form feature is coming to Thrive Architect very soon and will be part of the theme as well. This is FANTASTIC! Exactly what I’ve been dreaming about. Easy customization of my blog without constraints of current Thrive Theme. Yay…so excited for the release of this! You guys are great! This is a game changer. It will kill the need to develop or buy a new theme to meet a clients needs. Every website designed using this theme can/will be unique! You guys don’t need to create anymore themes either, just educate people how to use it and published templates that can be used within this theme…. Genius! I’m already part of the Alpha Squad, so I can’t wait to test this out. I’m assuming that once it is officially released, this will be included in the membership for current members? Yes, this will be included in the membership. This news is like Christmas to me! I’ve been anxiously awaiting this day for months. I submitted to be a beta tester, can’t wait to see the new theme builder. I know it will be another amazing TT product! This is so darn exciting. I can’t friggin wait. How do I change over to be able to use this new theme? Will I need to make each of my current sites pages into templates or should I plan to start each page again from scratch? It will be like any theme switch in WordPress. In principle, all your pages will still be fine after the switch, but depending on how you change the layout and templates, you might have to go into some individual pages and make some changes. Nice work, Shane (and team)! Looking forward to making the switch. This looks great, this is something I have been waiting for. Maybe I can now go back to a Thrive theme, as I’m now using GeneratePress. I hope that WPML, WooCommerce and Toolset plug-ins are supported. We plan to integrate with many of the popular 3rd-party plugins, yes. Toolset is another must – that would be amazing. LearnDash gets another vote from me…that would be truly fantastic as I am getting so many LearnDash enquires these days…every day pretty much. I agree, I use LearnDash too. This looks absolutely fantastic! Really looking forward to it. I really like the concept behind it. Please, do not mess it up the way you did it with Architect. Do not release it until it is ready. There is no backwards compatibility between this and the previous themes. The gap in technology is simply too great. Basically all the problems people experienced with the upgrade to Thrive Architect were related to backwards compatibility. Awesome! I’ve been waiting… and hoping, but never expected anything like this. Christmas in July! We’re excited about bringing this to our customers as well, finally! Seems to me that Thrive will soon build a framework that will be WordPress independent and we will just use Thrive to build sites without WordPress at all. Well done. Works for me. I wouldn’t go quite that far. We’re still building on WordPress, after all. But the goal is that you basically don’t need anything other than Thrive Themes tools to build and optimize your website. Yay! I’m so excited for this. I’ve been wanting something like this for years. I can’t wait to try it out. Excited to test and experience what looks like the next level in WP web-design. Great work to you and your team! Yes! Yes! Yes! So excited that the release of the new theme builder is around the corner! Thanks for your thoughtful and hard work creating this. I don’t mind getting my hands dirty tweaking CSS, HTML, and PHP in the backend. But I’d rather not. And a front end theme editor is going to give me exponential speed in my web development. I’ve tried other theme editors but they come up lacking. Can’t wait for something built for and by thrive themes. Thanks! This looks promising – great job. Will it work with ACF? Maybe. I can’t promise anything yet. I’ve been praying to the ThriveThemes Gods for this and they have answered my prayers! ???????? I’ve been waiting for this to come out before fully rolling out our beginners blogger course. I think this will be a game changer for new bloggers who want to design a pro-looking website from the ground up, as well as niche site builders and those with multiple websites. Great work. Can’t wait to see the beta version! Do the Thrive Alpha Squad (aka beta testers) still have to sign up above for the beta testing? Q: Since existing Thrive themes will only be supported through the end of this year, will there be a way to “integrate” my current Thrive theme to function with the new Builder? (Like how TCB elements could be upgraded to work with Architect)… If not, what are your recommended actions in this case? Regarding the date style in Pressive: you can easily replicate this in the new builder, yes. And we may make some modernized versions of the previous themes, to make the transition easier for users as well. This is exactly what I wanted as I’m never completely satisfied with the themes I find, either they have a bunch of features I don’t need and make my website heavy, or they don’t let me customize the header, archive page and footer the way I want them to be. I was never ready to learn how to code so this is just perfect! Excellent! looking forward to this!! a) Since Architect is – to my knowledge – still not GDPR-compliant, since – as I understand – you built Google Fonts so deeply into it that the team – to my knowledge – still hasn’t been able to isolate it back out, how will you handle Google Fonts here? b) When will Architect be GDPR compliant? c) Shouldn’t Architect GDPR readiness take priority over this (reckoning that most probably both projects will take up a lot of ressources)? Please refer to this post about our GDPR features and this one about more practical GDPR implementation advice. This is just fantastic stuff Shane. So you could stick to one basic theme and make as many variations using your imagination. Question: Will this will let me work on one of my currently installed Thrive Themes in WYSIWYG mode – for example – on the Squared Theme? No, this will not be compatible with the previous themes. It is a new theme that replaces those previous themes. I’m very excited at this new development. I have longed to be able to tinker with the existing Thrive themes, as I only like 3 of them, and even then I only use Focus as a rule. Now I have the chance to change them to what I really want, or what the client wants or needs (there is a difference). Will there be scope to change individual pages if necessary? With the theme builder, you can create your own templates. As many of them as you want. So, if you want a template change for an individual page, you can simply create a new template and load it for that specific page. Although in most cases, you’ll probably want to use a template for more than one page. But yes, in principle, this is possible. This is a really important point. I agree with your that performance is paramount for any website. There will be one big advantage of using our theme with Thrive Architect, which is that we can make everything leaner and more optimized. And of course, we’re building this a lean as possible. On the initial release, we will aim for a simple, fast theme already. After the basic features are built, we will spend some time specifically on further performance optimization and performance related features. I am doing a dance because of this! Can’t wait for the official release date to be announced. Wonderful news – congratulations! Are you anticipating (hoping) for the completed version to be available by the end of summer? That’s what we’re aiming for, yes. I do hope however it’s not only visual-based, but also full featured in the settings, like changing the breakpoints for responsive sizes. With the current themes that’s a ‘nightmare’. I also hope there’s some great built-in function for image-resizing, preferably on upload. So a novice can upload a 5mb photo right from their camera and the theme will take care of the proper resizing…a bit like the option in current theme’s, but on steroids. And of course a section for placing custom codes like CSS and tracking codes, like the option in the current dashboard for all LP’s. Yes, the responsiveness here will be much improved over the old themes. Regarding your comment about images: this is something I want to build into our products, but it won’t be part of the theme, specifically. What you describe is challenging, but I believe we’ve found a way to do something like that. Does “the responsiveness will be much improved” mean we will be able to create custom breakpoints? That is something I would also like for Thrive Architect. Sometimes 3 are not enough especially when having clients with large screen resolutions while still optimising a website for standard laptop resolutions. Wow! This looks very useful. I am very excited about the possibilities. If you can pull this off and maintain stability through WP updates I am sold! Thanks for the insightful and dedicated work you do to make WP so much better! Looks like another game changer for Thrive, look forward to the public release. Very excited, I kept wondering why is it taking them so long to make a new theme to work with Thrive Architect. This is a huge improvement on the current way of building the WP sites!!!! Excited to try the beta. I’ve built a site using Architect, but the blog page and posts don’t look anything like the rest of the website. I can’t wait to convert the blog to look like the rest of the website, it’s exactly the feature I’ve been waiting for! This will be just what you need to bridge that gap, yes! Will this theme editor allow us to edit woocommerce product pages on an ecommerce store? I feel like that’s one of the few things missing with thrive architect and your themes! It won’t be in the release version, but creating a full WooCommerce integration is high on our list of priorities. And yes, that means you’ll be able to edit all WooCommerce pages with this visual editor as well. That would be great! Thanks for the response and looking forward to that update. Shane, one important thing to make a better WooCommerce page product is the ability to get SPECIFIC PRODUCT DATA, like PRICE, DESCRIPTION, or other info that isn’t a Woocommerce default shortcode. There’s a plugin that creates shortcodes for those data, but get it directly on the editor would be awesome for create really unique product pages. AWESOME… at last a proper approach with convenient time saving builder to create my own theme layout & not single pages layout. I’ll be happy to test it & give my honest feedback. I believe it will also make the site load faster… looking forward & happy for this development, great work, as always. Thanks. Thank you, Ahrale! I’m looking forward to your feedback on this. I’ve been waiting a long time for this so super stoked that it’s not too far off now. Thanks for this update. I have been waiting for this new “theme” for months. It looks amazing. Can’t wait to upgrade the look of my website. So… not a theme, per se, but a framework on which to build one. I’m assuming there will be theme templates? Yes, it’s a theme builder framework that comes with templates we provide or for which you can build your own templates. Yes, looks great. I was an early user of WPMUDEV’s Upfront, which had potential but remained clunky compared to TA and they’ve since shuttered it. Have moved one Upfront site to TT and all my highly customised Upfront pages have been rebuilt using Architect. Which means I have two different menus throughout the site. Looking forward to this! Yes, this will help unify everything on your site! This is amazing. Thank you for your commitment to constant innovation and staying on the leading edge. Thanks for your feedback, Jasper! So “Skins” will be the way we will be able to save, export/import, and manage customizations to this new ultra-theme? Is there any planned support for custom subpages outside of the standard blog post, full-width, etc. that you typically see with themes? Would customized “Skins” and similarly customized “page templates” be combined into a cohesive bundle for export/import? Or would each customized template and the customized skin be exported/imported individually? The vision we are working towards is that you’ll be able to export your entire website’s design, including all the theme templates, all the related landing pages, all the related opt-in forms etc. as one unit. Thanks Shane – that sounds really useful. These are much anticipated great news. The product looks amazing, powerful and promising. Everything you would expect from your high-end product design. I´m guessing this would be great to work with on a new WordPress install, because changing an already built website, would require a lot of adjustments. The change, however, might be worth it. Thanks for sharing and for all your hard work. Thank you for your comment! Moving from one theme to another is always a bit of a pain, on an existing website. This won’t be any different, I’m afraid. But you can definitely do it, especially if your hosting comes with a staging feature. Using WPX Hosting. Great service and definitely comes with a staging feature. That explosion you just heard was my head blowing up! Hahaha… I did not mean to blow your mind. Why are you calling it Theme Builder again? It’s still Thrive Architect isn’t it? This is a new product. It’s a theme, not a plugin. It’s not Thrive Architect. I agree with those who have said this is a game-changer! Thrive Themes’ membership is the gift that keeps on giving! I can’t wait to see this new plugin and test it out! I signed up for the alpha, let’s see if I’ll be among the lucky ones that get to play with it! :D Keep doing your best! Thank you very much, Lucia! Finally! This is so awesome. I’ve always said Thrive is great for landing and home pages…but the inside of a site doesn’t get the same love in any significant way. With this theme builder, I’ll be able to make the rest of my site look as great as the home page. That’s GREAT news! This is exactly why I love Thrive! Never settle and always keep innovating. So glad I took the decision to buy Thrive Membership! As a newbie, I don’t get it. For me – to get started, (changing over my dinosaur sites that someone else built) I need to build a long form sales page with a few audio players and free mp3 (music) give aways, some images, a few videos and stuff. I have ConvertKit. After the sales page, I need to have both – a blog and eCommerce sight all in one. I have no idea where to turn. I am thinking of using Thrive Cart. We have 400-500 single items to sell (digital as well as physical products). Maybe do a LeadPages sales page. Feeling lost and overwhelmed. I started a Thrive Themes sales page 3 months ago and don’t like where its going. Is it possible to just delete it all – including the theme and start again from scratch? How do you do that? Perhaps with this (another) “new thing” – I should just wait and start again when everything is released and working good. Would a LeadPages page work in the interim? Your thoughts and or help? Since you have many different products to sell, I’d say that the basis of your site needs to be ecommerce. In our current toolset, ecommerce has never been a focus, so I have to say that our tools are not ideal for ecommerce. We will amend this with the new theme, but I don’t know if waiting for us to get around to that is a good idea. For an individual, long form sales page, definitely use Thrive Architect. If you’ve started and don’t like it, you can use the revision manager to go back to a previous version or you can just reset the template or load a new one to start from scratch. But from what you describe, it sounds like you need an ecommerce solution, first and foremost. Your options there are mostly WooCommerce for WordPress or a hosted solution like Shopify. So if I sign up as a new member…do I get any themes in which to start with? which says I don’t have access to the page (and I’m logged into my account). This should work if you’re logged in and a Thrive Member. Please try the link again if that’s the case (not the error link, the one in the post above). It seems to be working for people, since we’ve gotten many new applications already. Amazeballs. Simply amazeballs. I’ve said this already and I’ll say it again. I hated anything remotely to do with building websites for years. Now I can’t get enough of this. That’s really awesome. Thank you, Tom! Thats amazing, thank you. Will we be able to edit WooCommerce layouts? Not in the release version, but WooCommerce integration is close to the top of our list of priorities. Shane, your concept is the ‘logical quantum leap in website creation. But then things always look logical AFTER someone has shown the way. Am looking forward to the beta…Architect, excellent as it is, feels like too much work and abstraction. This is genius. No more messing around with choosing themes that are only partially editable. Now there are no limits. Thanks Shane and team for an already excellent product set, and for adding the killer tool for 2019 and beyond. Can it provide the ability to customize different pages layouts?! That’s just awesome, waiting for the deadline to come. This is what we are waiting for, the demo looks very processing. :-) Adapting your whole website design, including header menu, footer, sidebars etc, etc. Really great. Will the them builder have an option to export parts or the while design so it can be imported on an other WP website? Are you providing skins that more or less replicate the old themes? There will be WooCommerce integration, yes. As for importing and exporting: probably not in the release version, but we will build that feature later. How much later? 3 months? Release late July, 4 months later its October. Hi, this sounds promising. A question I have is: will I be able to use it to make customized global changes to the Squared Theme more, as I just spent the last year rebuilding my entire membership site using the Squared Theme? Hopefully that is the case. I’m looking forward to the final release. This is a new theme that will replace our previous themes entirely. There’s no backwards compatibility. Hi Shane, thank you for your reply. With all due respect, are you at least planning to keep the security features compatible with WordPress going forward for your previous themes? I literally had to rebuild my entire membership site using the Squared Theme, which has taken me many months because OptimizePress did this to me with the OP2 update, and so it killed my site. I haven’t even gone live yet, and I’m learning now you’re going to not support your older themes? Please Shane, at least keep the security aspects of your older themes alive to update with new WordPress updates going forward. I don’t think it would take that much to keep the security side up to date for us would it? I have a lot of respect for you and your company, and I would hate to be let down like that again. Sorry, but that’s my story. Yes, we’ll keep the old themes up to date for at least until the end of 2018. As mentioned elsewhere, that doesn’t mean the old themes will stop working on January 1st, 2019. If you want to keep using an old theme, you can do so for quite some time to come. Very innovative and clever Shane. No need now for the new themes that members have been requesting. It will change the WordPress world. PS I too would love to see ECommerce capabilities. Sorry for using a reference about other company. Its philosophy will be similar to DIVI from Elegant Themes? I’m an all Thrive Themes enthusiastic user and I think It would be great for me to integrate all your applications from the first level. I’m not sure what you mean by “philosophy” in this context. I am wondering, will the theme builder replace all the other Thrive theme products (like FocusBlog and so on)? Yes, it will replace all of those. Hallelujah! Thanks as ever, Shane. My Thrive membership continues to be my best-ever marketing and technology investment. That’s great to hear! Thank you for your feedback, Matthew. Yesssss! I am so excited!! I’ve dreamed of a customizable blog layout forever. I look forward to beta testing this, for sure. Thanks, Shane. Thank you for your comment, Stacey! Very exciting. I’m sure it’s going to be amazing. Can’t wait to build my first site with it. Thank you so much for developing this! I’ve got 3 sites that need rebuilding and this is going to make my life so much easier. This looks perfect. I think creating a separate theme builder is an innovative idea. It puts Thrive ahead of other solutions. But of course, I’m assuming that the theme will be optimized for SEO, speed, shortcodes and the million other things that I hope to never worry about. (It’s hard enough running my business.) Also, I’m assuming this will be fully supported going forward. Correct me if I’m wrong. Yes, absolutely. We’re making a very solid base theme, with everything you’d expect plus the visual editing aspect. I have been waiting for this and I am SO excited. Thank you for continuing to make Thrive Themes better! Can the theme be inserted in place of an existing theme on any WP website and used for all future editing? Yes, that’s exactly how it works. This is great news, that was one of the reasons why I still have not bought the architect, now I’m going to buy the theme builder. Congratulations. I’m very happy with this news. One question, do you think about releasing open source so that third parties can create addons for your plugins? Thanks for your comment! Yes, we do plan to open up to 3rd party developers at some point. We’re not sure about the details of how to implement this yet, but it’s on our minds. This would be great. I think a lot of the tools people are asking for above, such as Toolset, AFC, LearnDash could be added by third parties. Even more which are outside the scope of what you and the team plan to integrate. This is revolutionary. A drag-and-drop theme builder is something every blog owner hopes for. It looks like something magical. Thank you for making it available for members of Thrive University. You are a genius! This is super exciting. Can’t wait to play with it. I hope this will make things easier, because right now (I’m a Thrive member and came from Weebly) I’m lost trying to create a blog using Thrive Themes. Weebly by comparison was so simple. Would love for Thrive to offer a set of pre-made websites with the basic pages (home, about, blog, about us etc) already created , that can be modified and customized easily. Yes, pre-designed templates are an important part of this. The detailed editing and customization is possible, but it’s not necessary. Greetings from Japan. Sounds like great stuff. Look forward to when it comes out. Question: As mobile is a big deal here in Japan, will the new Theme Builder give us the ability to finely tune the mobile layout separately from the desktop layout? Yes, absolutely! You’ll be able to tweak and optimize the mobile view just like you can in Thrive Architect. This is something I’ve been waiting for! I can’t stand how WordPress separates blog posts from pages as a separate system so having Theme Builder capability makes creating websites complete from the ground up using the same page builder functionality I’m used to Is exceptional! Can’t wait for this release! One more thing…as others have mentioned but a bit further, with the new theme builder will you please bake in different drop down menu and main nav customization opportunities? I don’t want to have to use a separate plugin to create a 3 or 4 column mega menu or to have to use custom CSS to change a hover color in the background. I also use Divi Builder from Elegant Themes and you can spot a Divi website a mile away because it’s tough to customize their themes main menu navigation. Plus, they don’t have a theme builder so I’m thinking to stop using their product and go 100% all-in with thrive once I test the theme builder. Long post sorry just excited! very exciting development! Can’t wait for the live version. I can see Thrive Theme Builder solving a ton of issues that I have had to find workarounds for! This looks incredibly interesting. I have a question about when you get rid of the sidebar where does it go? Those sidebar widgets are rather useful and they seem to totally disappear when you go to the full layout mode or grid mode. What happens to the side bar? When I delete the sidebar, it is deleted entirely from the page template I’m currently working on. Now, you can create as many different templates as you want, so you can have some with a sidebar and some without. You can also save your sidebar as a Symbol, if you want to use the same sidebar with the same widget configuration on different templates. Yes , thrive is great theme . I have a question how to add my Optvin page in ? I’m not sure I understand your question. 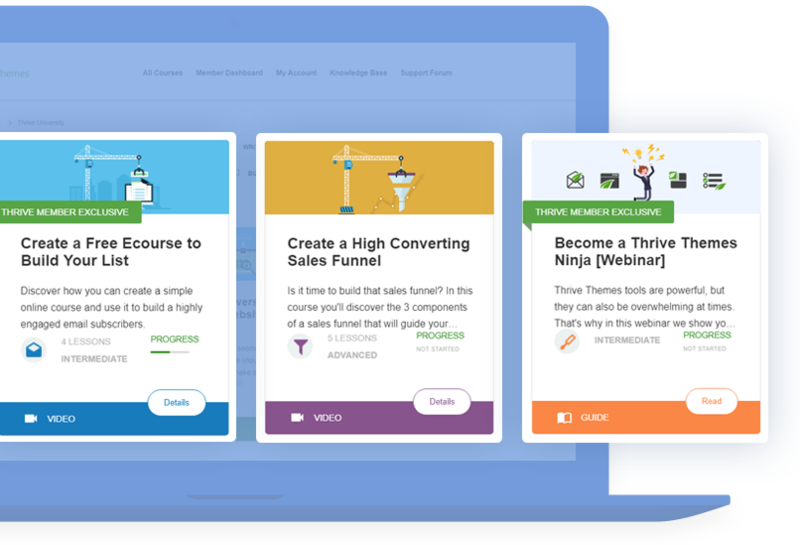 With the theme builder, you’ll still be able to use your opt-in pages and landing pages as usual. This is very exciting. Just have a question about WP Theme upgrade. For example I’m using a certain theme (“theme X”). I used this Theme Builder to apply some modifications (skin). Then, the maker of “theme X” gave out an update. If I update “theme X”, will the modifications I made be retained ? Wow, a real game changer. I love that when you change one element it changes the others automatically, a real time saver. Another big bonus of my Thrive Themes membership. I can honestly say Shane that Thrive Themes continues to deliver and is a breath of fresh air in the crowded internet marketing space. I’ve been thinking about buying the membership, but I’ve only had my website up and actively working on it for about 6 months. Still so much to learn :P.
Someone had mentioned to me that Thrive is excellent, but difficult to learn. By the looks of your video, it doesn’t look too hard. I really like the fact that I can design it the way I want. Right now, any major changes to my theme required an email to support and they change it for me. So I have no idea what they did, and whether or not I can repeat it myself. Is it possible to transfer all my content to the new theme when it has it’s public release? The good news is that themes are independent of content. So in general, you can always switch between different themes and not lose any of your content. However, I also have to say that a theme switch is usually a bit time consuming, on an existing website with content. You won’t lose any of your content when switching, but to get everything just right, you usually have to check your posts and important pages and maybe make some further edits or changes. So, switching themes is possible without any special features needed, but depending on your current setup, you’ll have some or a lot of work to do to “finalize” the switch. This is fantastic news! It looks amazing! The only thing I don’t really like about Thrive are the Themes. I mean I do use them and they are ‘fine’, but I often buy in X-Theme Pro and use their terrific header and footer builder. I then use Thrive Architect for page editiing as Cornerstone (Built into X) is slow and pretty clunky – Architect is simply FANTASTIC, fantastic – I have tried them all and the speed of my page editing is tremendous thanks to Architect! Thank you! WooCommerce itegration is clearly needed and wanted by many – I agree. I am getting so many LearnDash enquires for some reason these days – it’s an inreasingly poplular platform and online training is massive and growing at a studid rate!!! This is so exciting and thanks to all of the Team at Thrive – you are doing wonderful work. The beta tester link doesn’t not work here. great job as always – ahead of the crowd. thumbs up. looking forward to this. Just like nick4 – my biggest pain point is the woocommerce checkout page and woocommerce customisation in general. would be awesome if you guys could come up with a checkout page builder (with upsell option – omg…) so I don’t have to surf around the web and test plugins that don’t work as they should most of the time. and also: pleeeese include a simple contact form element. We’ll see what we can do. Ideally, we want to create an interface just like the one for posts and pages, where you can drag and drop all WooCommerce related dynamic content into any layout you wish. Do I understand right, that you can make your own theme lay-out with this that you can use as a base and install this on websites for clients? This sounds really good. Hopefully, it will be fast loading too. Shane why is not included in Thrive Architect? With Elementor Pro for example in the Pro version there is the Theme builder…….. could it be an addon for Thrive Architect? Thank you in advance, for your answer. Theoretically, it’s possible to make a builder as a plugin and apply or override any theme with what you build. But the end result isn’t the kind of thing we want. Because you end up with kind of a “fight” in the code, where the theme tries to load styles a certain way and the editor/customizer overrides those styles with new ones. As always Shane thinks about the things that make WordPress simply better. This is quite revolutionary and if it works well, it will remove a lot of frustration. A major question I have is: please make sure the conversion from desktop to mobile layout is perfect. I have been tearing my hair out because layouts I made in Thrive Leads or Architect converted badly, with font sizes and buttons even getting larger in the mobile version, which is absurd. Shane you are a genius in the solutions you come up with. Please make sure the programmers go the extra miles needed to make this brilliant idea something that indeed works without a ton of absurd bugs. I hope the beta version will take care of this. If the theme builder works well, it will be a dream come true for me and many creatives who have always felt so limited by the available themes, and all the problems arising through css customization. Thanks and good luck with the further development! Looking forward to this. Great work. It would be great if changes I make to the mobile view of a page indeed only apply to the mobile view. Now in Architect when I switch to mobile or desktop view, it often looks wrong, so I make some changes in order to improve the mobile version. But then these changes are also applied to the desktop version, which creates a new problem. Make sure changes to the mobile or tablet version are indeed only for these versions and not for desktop. In other words: make it possible to tweak the desktop, tablet and mobile versions seperately to make them the best they can be. This is something I’d like to ask you to show in more detail. Ideally, a screencast of the steps you take that lead to mobile (style) changes to be applied to larger screens as well. In a normal operating environment, this is something we can’t reproduce in Thrive Architect. If you can, please open a support ticket with details on the steps that you take that lead to this issue. This is really spectacular Shane, congratulations! that made me want to become a member again, very exciting. Thank you, Rico! I’m glad you like what you see. This sounds and looks great (and at the same time a little bit overwhelming), Shane & Team!! The most important thing for me though, is that I’ll still be able to copy/paste my (plain) text as a whole on to a new blog page, because that’s a huge time saver. True front end editing. Yes!!! I have wanted to customize post grids and sidebars for soo long. Thank you guys! Can’t wait to test the Beta! Shane I’m a big fan of everything you do, and “how” you do it! Much respect brother! You built EXACTLY what I wanted! Been meaning to suggest it to you guys but you just went and did it. I am so glad to have a membership with thrive themes! Hey, Shane. This looks amazing and what I’ve always wanted. I wanted to ask you if you’re planning to set like a demo where we can test ourselves the theme builder. I’m of those who like to try before buy anything! And actually I just got to know Thrive Themes yesterday so, I guess you get me. Yes, we want to set up a demo like that. However, it’s not something we’ll have ready by release day. Will we be able to change layouts for particular categories custom post types? I’d like for my podcast archives and posts to have different layouts than regular blog content. Will this be included? Yes, you can create different layouts for each category if you wish. I knew it! I knew you guys were up to something big considering we have not seen any new themes in a while. My goodness gracious….I cannot tell how I wished someone would get me out of the Theme menu settings…I hate them. This sounds simply too good to be true!!! If this guy will help me build a nice Video blog…I’m all in! Is that the case Shane? This is great! Can’t wait for it! This is absolutely fantastic. You guys are geniuses. I am so glad to be a Thrive Theme member. You are always seeking to make things better, easier, and more beautiful. I can hardly wait to see the Beta and the various skins you will make available. And if I know you, there is much more coming because you never rest from giving us the best. This new tool sounds very promising. Can’t wait to try it out. Hi Shane. Thanks so much for the insight into what’s to come with the new theme builder. I for one have been checking daily for months for any news on this and have badgered you a few times in the comments for an update on progress. So excited at the possibilities that this has in conjunction with all the other magical tools you guys and girls are continuing to provide. My head explodes with the potential of finally being able to put all your products to use on one site – and then replicate it for other sites. Not sure that I am technically competent or confident enough yet to be a Beta tester for this but as a Thrive member I am looking forward to being able to utilise all the bells and whistles that we get as members. 1. Does the new theme builder have any similarities to a theme framework (similar to Genesis) but that is customisable in its own right without the need for any other WordPress theme to be activated? (I’m so intent on only using Thrive products where possible). 2. You mention the potential for some pre-built skin templates for the new theme builder. Are these pre-built skins going to work in a similar way to that of the ‘child themes’ that Studiopress provide for their Genesis framework? (Sorry to mention a competitor but had no other comparison to use to get my thoughts across). 3. I’m not very creative or design orientated and work best from working examples so any chance that you can consider designing some skins/theme builder templates that are related specifically to the huge and growing pet care/animal welfare industries i.e. pet stores – animal rescue shelters – dog walkers – pet sitters – pet grooming etc? We see your team referencing in your excellent tutorials lots of the usual niches such as food, fitness and fashion etc but very little in the way of other niches out there that perhaps aren’t as mainstream but nevertheless are accessed by almost every household and becoming more and more popular. 4. Do you have any idea how long you anticipate the Beta phase to run before you are confident in releasing a working version of the new theme builder – 2018 or 2019? 1. Yes, the theme builder IS a theme. It’s not reliant upon other themes. 2. No, these are not child themes. Child themes have some significant drawbacks, in my opinion. However, it does have a similarity in that you can apply a skin and you can update the core theme builder product without it affecting your skin. Design and core functionality are kept separate. 3. Our goal is to provide a steady stream of use case oriented, business oriented and pragmatic skins for the theme builder. As usual for us, we’re not going to just churn out some eye candy for the sake of it. Each skin will be carefully crafted with a business purpose in mind. And yes, we might cover pet care at some point as well. 4. As long as it needs to be and as short as possible. A public release is definitely happening this year. 1) Will the themes be better optimized for speed and search engines? Bcoz a frontend editor can add a lot of additional weight to the site. 2) This new theme is certainly going to take Thrive themes to the next level which means more customers. How do you guys plan to take care of customer support? Bcoz the customer support in post Thrive Architect era has not been as great as it was in pre Thrive Architect era. This is exactly what I’ve been waiting for. Great addition. I have one particular request (for both this and Thrive Architect) and that is more global styling options. I’d like to be able to create global font, color, padding, margin and other type options that I can apply across a page, template and/or site. Then, if I want to change the look or feel of a particular element, I just have to update the global property once and it automatically applies to all the relevant areas. I’d take a look at Tachyons and Tailwindcss and apply what they are doing to CSS to your page/template building. Either way, thanks for the great work. that sounds like next level!!! Is it possible to do sticky headers and floating with this theme? Yes, I agree that its exciting with this new theme, but what about us starters that are still toiling with earning a good wage, shoestring marketing and we bought the theme with the idea that it would be good for at least a few years? Are we going to be fleeced for another theme? With a place like Envato market generally, when you buy a theme you can use it for at least a few years, some for many many years with free updates? So ok, you say you will support it a little, but eventually… you will not support it anymore, and what will we do then? how much will we pay for a theme that we thought would have at least lasted the test of time… ?? Then I’m beginning to think, what about next time? how long will it be before there will be another new product and this one will phase out, then I will be forced to buy again! Don’t get me wrong I love the products, but I really don’t think you care about us little people …to just release a new product and before it’s out of its infancy and before you can make it work with woocommerce, phase out updates to your themes that we are already using. Was this such a well-considered move?? I was a huge fan of Thrive Themes but I honestly see this move as a huge betrayal of customer trust!!! I absolutely disagree….I´ve been waiting for this new Theme Builder since TA was introduced. I am a little bit disappointed, that Woocommerce is not in the initial version and learndash is complete ?…. As a matter of fact…..conversion focused, as mostely all of TT customers (as well as TT themselves)…should mean, that each of the users want to make money in the internet. for me, they want to buy something….hopefully something which supports the customers and bring them a big benefit. I don´t know, how you earn your money….but it seems that you should think about your expertise and if it is not building websites, than I can´t follow your explainations. Shawn, if I think of apprentice in comparison with learndash…I would love to move to apprentice, but I unfortunately I miss a little addon “WOO-Integration for Aprentice”. Thank you for your thoughts, I was hoping for an honest reply from Shane, but you have engaged with on this subject, and your the only person to do that so far then I will gladly reply. I was quite happy to modify the theme to meet my needs, and if Thrive Themes ‘Shane’ came forward and offered us faithful theme owners some kind of special discount to move to the new theme, then great, BUT no !! But I would really appreciate a real comment from Shane, or will my comment be too truthful about how I feel to deserve anything but “ignore it and it will go away” kind of treatment? At the end of the day tweaking a theme to look pretty is not the be-all and end-all of making money, the real dice is the content and it always has been, do your websites solve problems for people? Anyway, I really do love what thrive themes are doing with their development and everything in general, they are or were, awesome value and work really well, the point of all this is they I really feel betrayed as a customer! It’s because the current themes were pulled and we must buy another theme, no special price for an upgrade, no email to us customers that bought a theme to tell us what we can do as loyal customers, nothing!!! How would your customers feel if you built them websites then after a little while said, well your website should work ok for a while but it won’t get updates anymore so eventually you will need to have my new theme, oh and you will need to pay me again even though your happy with your current site, I know you paid me already, but now you must pay me again to re-do your whole site with the new theme, even though your happy with what you have you are going to have to pay me again, no choice because what you have will break sooner or later?? Volker H – I know of course its not your fault, but since you commented I was trying to convey to you how as a customer I feel betrayed by the way this was done, now many will perhaps brush it off, but come on, your not telling me that no one else feels like this? Which theme company that is big like TT do you know that have just pulled their themes in such a short space of time? Name me one that has done this and forces their customers to buy again a new product because they pulled the old one? Let me jump in and clarify something here… this is an announcement for the Beta version of the new theme builder and the fact that we stopped selling our themes does not mean that we “just pulled our themes in such a short space of time” or “betrayed our customers”. We’ve always been more than fair with our existing customers and have absolutely no intention in changing that! For example, people who bought Viral quiz builder (a plugin created even BEFORE Thrive Themes existed) got a MASSIVE discount when we launched Thrive Quiz Builder and decided not to continue improving on the older version. And we did not offer any communication about changing from one to the other because it’s simply not a thing yet! When the theme builder is actually ready for the public, there will be a launch and, as always, existing customers will get the opportunity to get on board for a very fair price. Well, I must say you have really clarified the situation, thank you upfront for that. Nonetheless, your continues fair treatment of existing customers was probably my biggest concern, and to have you confirm to me that this will still be the case then I am more than happy! So I interpreted Shanes lack of response about a discount towards the cost of the new theme (for existing members) and his allure to only state that there would be a launch discount of sorts to actually mean you would have your usual launch discount and that would be it, no existing member consideration. As you may be able to tell I read all your content, watch all your video’s and read a considerable amount of comments and replies when I’m not working, of course, I’m a huge follower and fan of Thrive Themes and Shane and his other Blog also, no to mention the podcasts! I have always considered ThriveThemes to be forward Thinking and customer focused so to continue like this is a relief and again I will thank you for also clarifying this point too. Best wishes, I will finally relax and thank you again for the time you took to reply to me, it is certainly very much apprecialted! Can’t wait to get my hands on it! You guys never take a rest in improving. Thank you for that. ThiveThemes membership really is a no-brainer. Will there be an easy way to handle those with the new theme? And multilingual is still an issue for us. Will the new theme support WPML? Not in the initial release, no. WPML is on our roadmap, but it’s not the highest priority. We are just about to add a forum to our website. We are currently using thrive architect thrive comments, and thrive leads, and plan on moving to the new thrive theme builder when its ready. What forum software do you use on the thrive themes website, or what would you recommend using that will be compatible with the new theme builder? We don’t want to start out with bbpress or anything else if we have to start over again. Be good to get it right from the start. It is about time :). Now maybe I can use Thrive Themes for everything rather than for just landing pages. I’m just wondering, are there any plans of including white labeling options? I’ve seen this in other providers which are kinda similar such as Astra and OceanWp who also offer a base theme and premium plugins – which include the option to whitelabel the theme name etc on the wordpress back end, etc. Since we can now have the capability to fully customize a site, it would be nice to customize everything in line with the brand. This is especially true for agency license users who serve clients – they are often times meticulous and would want to show off that their business own everything they are getting…up to details such as the wordpress theme name in their sites. If not, then you are still the most awesome option around. In my opinion. Thanks! I agree with this. It would be awesome if a feature like that is included! Agencies will have a one stop shop for all their needs, without bugging the developer everytime. That would be an awesome feature to have! We don’t have this planned yet, but since this comment got some attention it’s something we’ll take into consideration. Yeah, I agree with this one, please add white label !! Has this been past the Beta stage yet and it is fully available yet? Yeah! i would love to see that happen! I would be really great if they add that to their products! This looks like an amazing development. I’m currently buiding a new website using the “Ignition” and Thrive Architect, plus using YellowPencil visual CSS editor plugin for some additional theme customisation. How will the visual theme builder cope with such CSS customisations on an existing theme in the conversion process to the new theme/skins that are part of this exciting new product? There’s (almost) no backwards compatibility between the new theme builder and the old themes. Most likely, customizations you’ve made to the previous theme just won’t have any effect on the new one, because there will be different selectors used in the new one. But also, a 3rd party customization tool will no longer be necessary. The theme builder is used to create your templates (like blog posts, pages, archive views) and Thrive Architect is used to create the content inside those pages as well as landing pages. Exactly! This gives you direct access to all your site’s styling. Awesome – EXACTLY what I always wanted! This new theme builder will it work with Elementor if we want to create additional pages? For someone who is starting with Thrive will the theme work with existing thrive templates, or is it preferable to wait for new templates specifically designed for the new theme builder? The theme will be a theme, existing landing page templates (from Thrive Architect) will not be affected. I think there is a feature very necessary for theme builder o thrive architech. I think about the possibility of making forms with several fields, and also that user can iclude a hidden field Like other plugins do. Hi Shane… I’m an extreme newbie, as in, I’m still going through Thrive University to learn what to do when I start building my website this summer :) After reading all the questions/answers above, I’m left a little torn… since I haven’t started building anything yet, should I start building my website from scratch with TA/one of the current themes? Or, should I apply to become a beta user, and start building my site with TB (with the understanding that I wouldn’t be able to go live until TB does, hopefully by the end of the year)? Will the Thrive Theme Builder allow us to style the Elements in Thrive Architect so when we drop a Thrive Architect Element onto a page or post it looks right across the site? So instead of styling elements in style.css we style elements in the Thrive Theme Builder (minimal external CSS required). Eventually, yes. We are building all this stuff towards a final vision that will give you this kind of control over your site’s styles and elements. However, that’s further down the roadmap than the theme builder release. That’s great news. I’m really excited about this product. Wishing Thrive great success! – Which theme do you recommend I use now in order to have the easiest possible transition in the future to the new Thrive Theme Builder? – Among the skins you have in mind to offer with the theme, are you considering to include one dedicated to vacation rental websites? That would be awesome ;-) It could be an interesting segment for you guys as many property owners are going digital to have their own direct distribution channel. – Will it be compatible with WPML? And with any booking engine plugin? This looks promising and I look forward to testing it out. You mention “skins” and my question there is: are all the skins going to be included in the membership? I ask because I was with a competitor prior to Thrive and when they introduced skins we had to pay for them, even though we were already a “member.” This is one of the reasons why I switched to Thrive. That’s a good question. I don’t know the definitive answer to this yet, but I can say for sure that as a member, you will receive the theme builder and all the skins we release early on. We may introduce some limitation later on, where users who use many skins will have to pay extra, but as a member, you’ll always have access or “credits” to get new skins at no extra cost. For a single user with a handful of websites, the membership will always cover your needs. High volume users like agencies may have to pay for large amounts of skins. wow!!! Thrive Themes just keeps on getting better and better. Love the new update. Any idea what the ETA will be for this new update? We don’t have a final ETA for this yet, no. If I understand this new theme, I can make anything I want. Exciting news! 1. I can choose to have or not have a sidebar on any page. Wide page without sidebar or narrower content width with a sidebar. 3. In the future, I will be able to control woo single product page, category or tag archive pages. And guys, thanks for your forward thinking hard work!! Yes to all of those, with two clarifications. There’s not really a strict concept of a “sidebar” in the theme builder. You can place widgets anywhere on the page and you can create any layout. Meaning: you can create a layout with a sidebar or multiple sidebars or sidebars with complicated subdivision layouts or something that doesn’t fit the concept of a sidebar at all. Because fundamentally, you can create any layout that is possible with HTML/CSS using this builder. And regarding post layouts: initially, there’s no feature that associates a specific layout with a specific category or tag. But you can create different post layouts and choose them on a post level. Plus, you can use dynamic content to style those layouts. We may add conditional layouts like “category X = template Y” in the future. I am in my second year of a full membership. Before this I had 0 experience building web pages or websites. I found that I absolutely love building pages and sites. While I am still not very good at it yet, when I get a client, I work at it until it’s perfect. Sometimes it takes me weeks to do it right. Mostly, I run into trouble with the things that should be the easiest parts. For example: I always find myself creating the same bits and pieces over and over or recently I built a whole site page by page without making a template that I could replicate. Instead I replicated pieces. There are so many questions I have that would make me so much better and efficient at building pages and sites. I built a dozen landing pages for free before I started charging. My first paid client I charged 2500 for their site and it’s taking me weeks, but they know I am going to deliver the best finished product possible with conversions in mind. I’ve probably invested well over 150 hours so far. I know it seems like alot but I am using all the tools, quizzes, ovation, comments etc. I really don’t care much because I get lost in the process and I feel empowered because I am getting more creative and better at writing copy too. I wish you guys had classes, contests, seminars, and more training (Design) videos. I watch every video and read every blog. I am a customer for life. One thing, I wanted to try to make a button beat, like a heart. Can you make that happen? Anyway thanks for making a really fun, useful and interesting product followed up by excellent videos and service.. I trust you’re already discovered Thrive University? If not, you’ll find more material there to help you grow. Woo HOOO! I can’t express how psyched I am about this. I’m one of those “all in” ThriveThemes guys who use your stuff exclusively. I have one tiny (maybe big) request. Back in May of this year, Hanne did a glorious post about the “Outside-In Principle.” This was much needed. Now my designs are bullet-proof. You, Sean, had briefly offered pieces of this strategy in your posts and tutorials, but not as a complete strategy that offered important and fundamental design information. PLEASE do one of these for your theme builder as well. The confidence that these type of instructions give me is immeasurable. Thank you for the feedback on this, Michael! I really hope this is truly optimized for speed (like GeneratePress). The current themes/widgets/shortcodes are not up to modern standards. Yes, speed optimization is an important focus for us. I like the comment plugin, does it has widget “Top commenter monthly” ? No, we don’t have such a feature. You can highlight specific comments as “featured comments”, though. I know some current Thrive themes have specific functionality on the back-end. For instance, PerformMag has ad management functionality. What will happen to all of this varying back-end functionality with respect to the new theme? There will be only minimal backwards compatibility between the new theme and the old ones. The gap in technology is simply too great for making this backwards compatible. Most theme specific features will no longer be needed, as their functionality is replaced in the new theme builder. The ad management in Performag specifically is a feature that we don’t have a replacement for yet. In the video, you showing demo for blog page, how bout singe page template? Secondly, how bout the menu? can we design it for mobile version also? Yes, single pages can be designed entirely as well. The reason I demoed the blog page is that this is the more challenging type of page to edit. And the menu, header and footer will also be fully and freely editable. I was going to ask you if something like this was in the pipe when i received the email with this great news !!! Thanks a lot for this great improvement. I know that Shane hate sliders on site but sometime it’s useful so could you tell me if there will be such a tool like that please? Hopefully, what it will offer is that you’d no longer have to spend all those $$$ to get the result you want. I love this! What a great idea, Thrive Themes just keeps getting better. Apparently the new Theme Builder is complete. Am I correct in thinking themes such as HeadwayThemes, Blox and Padma are no longer necessary, or of value with this solution. BTW, it looks terrific. I guess we’re filling the same kind of niche as something like Headway Themes, yes. Well I’m thrilled! I’ve been beavering away on a style for my brand of a few websites – all under the same umbrella and whilst I love all things Thrive, I found myself using a lot of the page templates over the themes. I decided to go with a page template and clone that so hopefully it’ll be relatively easy to swap over to the new theme and then make it all look the same. Always just amazed and awestruck at how fastidious and determined you all are. Thanks for making website building fun! Thank you very much for your comment, Leah! Yes, the theme builder will make it easier to have multiple pages and keep everything looking neat. Using landing pages is alright for a site with just a handful of pages, but once you have a blog and posts and so on, the theme will be much more useful for that. Whoop whoop, I’m so excited to be an Alpha Member now. Can’t wait to test out the new theme. And it makes sense you are making it a theme and not a plugin. This must be why my landing pages with thrive architect can’t effectively “Inherit” the custom fonts from my theme, huh? Will this be available in the first release of the new theme, the ability to add custom fonts? Custom fonts is something we’re working on separately, for the theme and for Thrive Architect. I’m not sure if it will be ready before or after the theme beta. Will we be able to install this theme on an existing website using a Thrive Theme (let’s say Rise) and Thrive Architect? Or would the site need to be rebuilt from scratch for everything to work properly? You can install it on an existing site, yes. You will probably have to rebuild or update some of your pages, but not moreso than is typical for a theme change. I know you mentioned that you are beginning the beta test phase. Do you have a projected time frame for official release? We don’t have an ETA for the release yet. Looks pretty slick. I’m not a beta test guy, but I hope you get lots of volunteers. Thanks for your comment, Erik! We’ve had many volunteers, yes. Looks like we’ll be able to get a lot of help with the testing already. Thank you for your comment. Currently testing is only open to Thrive Members, sorry. Shane – this looks great! Can’t wait to try it out. I’m aware that you can modify things any way you want. But with a theme DEFAULTS PAGE you would really be working simple to more complex. Yes, we have thought of this as well. We are working on a feature with which you can load placeholder content, so you can style your blog layout and other such pages, even if you don’t have any content yet. And we are also working on a page that shows an overview of all the text elements, so you can style those and see all of them in one place. Awesome! Can’t wait. Thanks Again. This looks very promising Shane. We are building a new site with Pressive at the moment which feels a little outdated. I fully appreciate you can’t give a precise timescale for when the new theme will be released but is end of August realistic? If so we can just about hang on till then…just…many thanks. I really can’t give you a useful answer, I’m afraid. Would we like to release the theme in August? Sure, we’d love to. We’d love to release it today, really. But we can’t yet predict how many issues may come up in testing and how long it will take to get everything ready for a full release. Understood. Thanks Shane. I think we’ll hang on and cross our fingers it’s August time…. Hi Shane, any hint at timescales or how to get in on Alpha/Beta testing? The theme is currently in alpha testing. If you are a Thrive Member, you can apply to join our testers here. Hey Shane has all this rolled out yet? It sounds like it would be best to wait before creating any new sites with TT is that correct? One great frustration I’ve had with WordPress has been how hard it is to make login page that matches your theme. The most popular plugin that does this, theme-my-login, still requires knowledge of CSS and is clunky. And now it’s no longer free. Am I missing something and the Minus theme has a themed login template? If not, will the Theme Builder enable me to customize the login template visually? So far, we didn’t plan to make the login page customizable. But now that you mention it, I can see how that would be useful. I’ll talk to the developers to see if there are any potential issues with this and if possible, we’ll add it to the to-do list. No, we don’t have a WPML integration yet. We have this on the roadmap for a future release, though. I’m in the alpha squad. I haven’t seen a link yet to the theme builder test download. Did I miss it? If not, when will the test be released? It will be released on the 25th of July, as announced in the post. Hi I’m a non techie thrive member who is trying to get his website up and going by himself. Should I get involved with this new product or do the best I can with what’s available? I have a hard time keeping up with all of the changes, but I’m genuinely impressed with the new Theme Builder. Would love to have my blog looking as fantastic as the example. Thanks again. Great news, we are creating blogs for our clients on many different sites and this is a gift. Yes please, would love to try the beta version. Having a business on the internet, I hope that this new wordpress theme will be even more efficient on the conversion. Seriously considering a switch as I’ve been using Thrive Leads for a long time. One question – I get a lot of traffic at the moment from Google AMP versions of my pages. Will the new Thrive natively support Google AMP or do I have to continue using a plugin to get this to work? Creating an AMP mode and AMP editor is on the roadmap. It won’t be in the release version yet, though. You have excited so many people with this announcement (myself included) that you need to get a (TO THE TOP button) to take you back to the top of this page – lol. This new theme builder is an ambitious project and looks like it will be a game-changer – bringing templates (for pages, posts, and archives) together under a common WYSIWYG design interface. I’m excited to put it through it’s paces. One thing that isn’t clear to me from your demo video… How will the new theme builder treat styling of embedded content (from plugins or shortcodes, for example)? One specific example would be Gravity Forms (which is an essential plugin for business operations/delivery workflows on some of my WordPress projects). Would the new theme builder interface be able to edit styling for those form elements? Or, does the builder’s styling power only apply to the page/post/archive templates, but not to the content within? Perhaps you plan on some kind of future integration architecture for 3rd parties (i.e., plugin authors) to address those kinds of scenarios? The theme’s styling features will apply only to theme elements (and elements from other Thrive Themes products). However, we are planning to build various integrations as well. As mentioned in other comments, we will make WooCommerce stylable with this builder. And we may also create integrations for products like Gravity Forms, if there’s demand for that. Thanks for the quick response, Shane! This builder will make our learning curve a lot easier. Thank you. In the video we can see that the top menu appearance is changed. My question is: will we be able to change menu structure/links from frontend as well? Or this part will remain in the backend settings as it is now? Really awesome! This is exactly what I’ve been waiting for. I can’t wait to start working with it. I hope that the transition from every Thrive Theme to the new Theme Builder will not take too long. I have a work contract with my customers in which such changes are provided for, but I hope that there will be no adjustments for days if I change the themes of my customers to the new theme. I am also very pleased that there will be a way to edit header and footer directly without modifying CSS. Will there be a possibility to shrink the logo and menu when scrolling? You guys are doing a fanstastic job. Keep up the good work. Thank you for your comment, Marion! Regarding the logo on scroll: we have this on the roadmap, but it won’t be in the release version yet. When we can download the new themes? I forgot to ask: Will we be able to build our own Focus Areas (Top and Bottom) with the theme builder? This looks mega – searched for so long for themes with the ability to display posts exactly how I want and this should make that job easy. It is a great news for us. I hope this beta version of the theme builder will be available for live website’s very soon. I want to use it on my site and I am waiting eagerly. Please make it fast. Yowza!! This looks incredible!! I love what you’re up to! Will this theme be available for existing customers with the same license? Or need to pay anything extra for this particular theme? I have been looking for a theme that gives me this kind of control. I love all your products and have since day one. Looking forward to the release of the Bata version on July 25th. To have this kind of design control I am looking forward to it. My Blog I am just at the beginning stage so to develop it with a product like this that I can grow into is awesome. I’m waiting for this theme! Nice article. I am waiting for the new theme builder but I want to buy focusblog individually. Can It Possible right now? Sorry we stopped selling the individual themes in June. Will there be a calendar/events style included? Integration and premade styling of Events Calendar Pro would be ideal!! when are you guys planning to release this? Looking forward to it. 1) Support, support and more support. 2) Compatibility for next versions. If I design 20 webs, I don’t wont to redesign everything when theme builder has a big update. 3) Woocommerce integration, this is the big one! Is thrive leads also integrated in this new theme? No, that remains a separate product. Wow great theme builder. Keep Ken update with progress. I just got a Thrive member couple days ago but I already missed this feature a lot. So this is an awesome news! This looks very promising. I wonder, how will the integration be with Yoast SEO? Now ThriveThemes aren’t really compatible with it. Looks great so far. We´re waiting for the official launch to re-build our site. I’m confused at some of the replies to questions about pricing for the new theme builder. Is this new theme builder going to be at additional cost to my existing Thrive Members annual fee (for Individuals & Entrepreneurs) or does this fall within the “Access to every future product, feature and update” promise that clinched the deal in me purchasing my membership? Of course it will be included in the membership. Having a checkbox in editing mode so that we can say exclude this page/post from the WordPress search result. Editing WordPress catgeory pages with Architect would be awesome so that we can optimize them for SEO. I hope there’s still focus areas. Focus areas that are completely customizable / editable via thrive architect would be perfect. Hi Shane, I have planned to use the Performag theme months ago and I just found out about this new theme builder. Don’t get me wrong I think it is amazing and I see the future of WordPress theme here. However, I have to get my project started soon and I need a theme. I’m new to the Thrive ecosytem and was considering purchasing Thrive Architect but now I’m wondering, How will the new Theme Builder affect Architect? Will Thrive Architect continue to live as an ongoing product after the release of Theme Builder? Or, will Theme Builder replace Thrive Architect? Yes Thrive Architect will live as an ongoing product! Thrive Architect is to edit the content of your website (such as blog posts, content pages and landing pages), Thrive Theme Builder to edit everything Theme related (such as blog layout, archive pages, etc.). Any chance you’ll implement the ability to manage custom post types in the theme builder? How close are you with releasing the theme builder? I’m so excited to use it and make my clients website look amazing. Any idea of time frame? before end of the year? I keep checking my email waiting for the release! I’m considering moving to Thrive having seen some of your Plugins in action. If I build a site using Thrive Architect then the theme is launched, will the customisation in Architect be portable to the theme? I agree with your ethos of having it as a theme rather than plugin, I just don’t wish to do the same work twice. Thrive Architect is used to create you content in the pages, this will be unchanged even if you switch from your current theme to the Theme Builder and if you create Headers and Footers in Thrive Architect, they will become available to use in the Theme Builder too. Will this theme have support for Custom Post Type UI and/or how will styling CPT custom fields and taxonomies work with the theme? If we are already experimenting and building with Thrive Architect, won’t these page types migrate to the new method/theme without much worry? Thrive Architect will still be used to create your content, the theme builder will be used to create theme related layouts. Hi, this looks super promising – when will this be released to non-beta users? I have multiple other Thrive products and this is the next one I’d like to add to my toolkit. This is a very exciting product. What’s the current expected release date? I want to buy your visual theme builder. Can you please tell me how can I have this? if it’s possible send me a link with proper step by step instructions. Super excited for this to get released. I’ve got some huge things I want to do with Thrive for my sites. Is there an expected time of release? Heya, love your work guys! I’ve decided to purchase thrive membership, yet have already started site with Elementor and the clincher to get me over the line would be this here theme designer. Any updates member on release date? We don’t have a release date yet. We will post it on the blog as soon as we have some news. No release date now? But didn’t you already have a release date that was pushed back? Some insight would be appreciated. We’ve never announced a release date for Thrive Theme Builder. We had a date for the first round of alpha testing, but never for a public release. Sorry, this product is still in development. it’s been a while since the start of the beta test. Any news on the progress you’re making? And more specifically, could you give a rough indication of when you expect the new theme to be launched? Many thanks and good luck with next/final steps! The theme builder is currently in alpha testing. We don’t have a release date yet, though. do you actually know when you will launch the Visual Theme Builder? We have no release date for this product yet. It is currently in alpha testing, but that’s all we can state at this time. Looks Brilliant – Is the launch still a long way off Shane? Looks Fabulous Shane! Can’t wait until it’s released. I’m frustrated that I can’t customise my posts the same as my pages at the moment. Thank you, Maggie! We’re working hard to get this ready for release. Thrive Apprentice is currently only available to members. When do we expect the theme builder to go live? I use Divi as theme and Thrive Architect to build some landing pages BUT I really want to use Trhive theme as my website theme as long as I like the way we build pages with Thive Architect more than in Divi. Please let me know when is ready to install the first stable release. When is the final release planned???????????? 1 – Does this mean I don’t have access to any templates when I’m building a website from scratch? 2 – Will the new templates have the ability to bring in different things to the thrive ecosystem? One of my challenges is bridging the gap between Thrive Themes and WP Digital Downloads – I don’t know how to bring in a cart icon, or a “log in” icon, for example. Hi Shane and team. Any update on the release for the Thrive Theme Builder? Will this be out in time for the Black Friday this year? We don’t have a release date for the theme builder yet, sorry. Is there a release date planned? An affiliate manager I was emailing went radio silent when I asked about an expected date range. We don’t have a release date for this yet. We’re currently still operating on “when it’s ready” for the Theme Builder. Shane, I’ve been using a popular theme builder / theme combination from another provider. I’m impressed by this new development – especially when it comes to bypassing all the backend confusion, and having to change the theme layout to get rid of the sidebars on each page. Can’t wait to get this and going to join the members! Hi there guys… just wondering, how is it coming along? Do you have a release date already? We don’t have a release date yet, sorry. Hey Shane, just wondering how close you are to releasing the theme builder to members. Hey Shane…just wondering…so…is this OUT yet? I can’t tell if you’ve gone public with it yet. We are working on the Thrive Theme Builder, yes. Why is this not out yet? I just invested heavily into a thrive project that I built out a separate theme just to match all the thrive pages for blogs posts. It was a giant pain! Because it isn’t ready yet. This is a big project and we don’t want to release something unfinished. 2. Will this builder be able to accept shortcodes? Short codes: yes, in general short codes will work in this theme. Hi Shane, long time customer here. Im eagerly awaiting the release date and the Woocommerce integration is soooooo important I don’t understand how you can ignore this gaping hole in your product ecosystem. Just read the comments here, reviews of thrive architect or themes from online marketers and reviews. They all point to the lack of a shopping cart of proper woo-commerce integration as a major no-no. Please explain in as much detail as possible or link to some resource that shows me exactly how do I best integrate woo-commerce with Thrive architect (Today, 11 December 2018). This would help myself and I can imagine soooo many current too. I’m sorry to hear about your frustration with using our tools together with WooCommerce. Currently, we have no specific WooCommerce features or integrations, beyond basic support for it in our old themes. Ecommerce simply hasn’t been our focus, so far. Our tools are geared towards information product and online course sellers and content marketers, mainly. We’re aware that ecommerce is another big niche and that many people use WooCommerce. But we’re also aware that we can’t serve everyone’s needs well, at the same time. I’m sorry I can’t give you an answer that’s more positive for your use case. Is there a timing on the release of this theme builder? What is the current status update regarding the Theme Builder? Looking forward to adding it to my product bundle! do you have any news regarding the final release date for the builder? Will it be part of the Thrive membership? Thanks. Is there any tentative date for launch of this? I like this idea of a theme builder a lot! One Question, are the current themes still available? Its impossible to go to the themes page because I always get fowarded to this page which is very confusing. Are there any plans for a release date?? Shane, I am a former subscriber, but I’m waiting for this release. Are you dead set against giving an ETA? Today is early February 2019, for reference. I am not asking for a release date because I can expect how much work this project takes. However, can you gives us please any new update whats the current status? We will have an update with the current status coming soon. Thanks for the info, Shane! It would be nice if these comments had a date so I could see when you posted this. Hi Shane, I am confused between choosing just the thrive architect or the membership plan. Are there any upgrade option available? I’ve been looking into Thrive for a while but 2.0 has been coming soon for a while. I see this was posted in 2018 saying beta in July.. Is that July of 2018? has the beta already happened? If so, what is the current state of this? I’m strongly considering going all in with a yearly membership but not being able to really see what I am getting or when this new product will be out is holding me back. I can’t view demos of the 1.0 Thrive themes, I can only view landing pages selling me those 1.0 themes that say “Sold Out” at the bottom. Would love an update on the release date. I hate to ask but is there a time-frame as to when the first official version of this will be released? Hey guys ! Can you give us some news about the new Architect 2.0 ? It’s been 7 months now and I thinks some of us would like to know ;P The release is still for July 25 2019 ? First of all, I love ThiveThemes and everything you guys do. This project looked very promising … when I heard about it more than half a year ago, it made sence why the old themes didn’t get updates in terms of WP-customization. I can only guess how difficult and time-consuming this project is. But in the meantime the current themes are very outdated. Especially compared to some other providers. If you look at the possibilities other builders provide (full WP-menu customization, building custom Woo product pages, better templates, …), it’s getting harder not to change to other pagebuilders and theme providers. if I knew when the new project is ready to use. Again I love using your stuff… but it sometimes feels like I’m being kept on the line. Any news on the progress? Please? I wish these comments had dates so that I could see how relevant they are. 1. That the new theme be as light and fast as Astra, OceanWP and GeneratePress. 2. That you launch templates for blogs that also sell online courses. PS: can I ask a third wish? That you launch it before june 2019. Today is March 6 2019. How does this interface with Thrive Apprentice? Hello. Please tell me where can I see your themes? Good stuff! Any estimates on when this will be out of beta and ready to be used on a complete live site? I was looking for a good builder for a long time. I took into account a few leading ones and came to the Architect. I liked the way of creating websites – similar to DTP and graphic programs, over which I worked over 20 years ago. There is no such Builder – this is unrivaled. Yesterday I wrote my resignation and asked for a refund, but I slept with this problem and I am stubborn and gave myself a chance. I said I would try again. You know what? Today I found the answer to my problems (parallax, gallery, headline, footer). :) Thank you. :) I stay. When can we expect this to launch. It’s almost been an year and we are actually waiting for it. Dear Thrive. how much more time do you need to consume before releasing this or new themes for us? Been patiently waiting since last year and so far, it seems nothing is happening.. What are you guys doing pls..?? will this new Visual Theme Builder only be for members or can i buy it also al a single lisence?